It was a lovely Spring day when we drove into Glenn Innes, a town on the New England Tablelands, about 8 hours NNW of Sydney. We’re in wool growing, cattle and sapphire country here—no prizes for guessing my interest! Yet, a visit to the tourist centre startled me with postcards of standing stones shrouded in mist, the Cornish flag and a proclamation that I was in ‘Celtic Country’. I pinched myself, I was still in Australia wasn’t I? Or had one Laphroig too many last night teleported me back to Scotland? But no, Glenn Innes is only a sister town with Pitlochry, not next to it, so I am not in a remake of Brigadoon. The first white settlers to this area, so I learned, were predominantly Scots in 1838. It was those pioneers who were the inspiration for this official national monument some 150 years later. It’s aim: to honour all the Celtic peoples who helped to pioneer Australia. Sapphires temporarily forgotten, I urged my companions back to the car for the quick drive to Centennial Park on the outskirts of the town. In no time at all, there before me was Australia’s Standing Stones AD 1992 in all their glory. It soon became clear that in the way of their more ancient cousins, the stones were not just set ‘any old how’ and much thought had gone into the design. In typical, practical, Celtic fashion, the designers worked with the site they had to best advantage. Later, when I spoke with John “Trigger” Tregurtha, one of the main orchestrators of this monument, he confirmed that dowsing was not carried out before the stones were put in place, although the organisers made sure that the intended site was not one of the local aborigines’ sacred places and with pride told me that not a single tree had been cut down during the circle build. The local aborigines were, and still are, supportive of the stone array involving themselves in the annual Celtic Festival held each year in May amongst the stones. The gold-coloured middle stone, Australis Stone, represents all Australians. The Gorsedd Stone, for the Cornish and the Welsh, and the Ogham Stone for the Irish. The Ogham Stone has an inscription carved in Ogham, the oldest writing known to have been used by the Celts. It translates in Gaelic as GLEANN MAQI AONGUSA, the Glen of the Sons of Angus. Since my first love is water divining, it’s always what I dowse for first to get my connection, my bearings as it were. So, I was surprised to find very little substantial water associated with the stones. A few sub-surface veins perhaps, but that was all. Map dowsing later confirmed this — if it had been just a paddock without the stones and I was water dowsing, I wouldn’t have given it a backward glance. But it’s not; the Stones certainly have a distinct presence, and since they were sited with joyous intent; are regularly used and visited, they should be an energy-dowser’s delight. 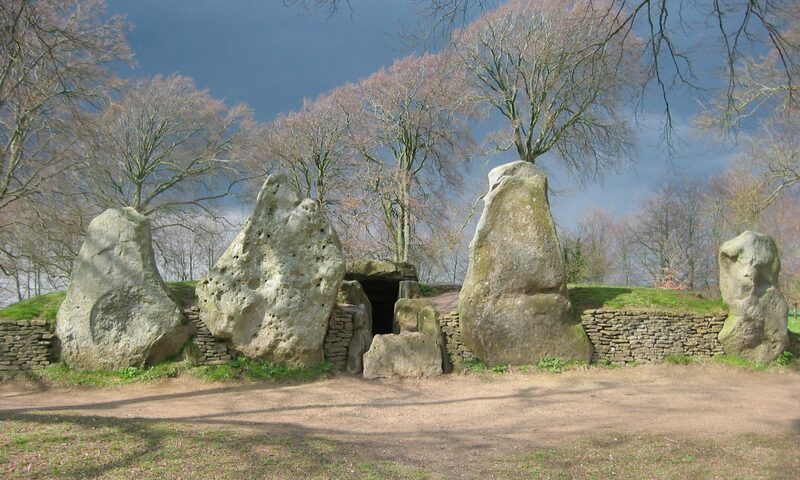 In my short time at the stones, only one line of connection was apparent for me — between the True South Stone and the three central stones, a band about 2ft wide, with the flow northward, and penetrating below ground to about 7ft. Map dowsing later, I could no longer find this line, so I was either wrong or it is/was transient in nature. John Tregurtha told me that a previous dowser also did not detect any water, but was amazed how well the stones connected into the leylines of the area. Doubtless there are more ‘connections’ and radiations from this remarkable arrangement and you can either visit or map dowse for yourself! I and the other newsletter editors would be interested in member’s thoughts.